Porcelain Veneers – Veneers are a great option for patients that are looking to enhance their smiles in more ways than one. Custom-made by your dentist, veneers are a popular treatment for severely stained, chipped or misshaped teeth. Crowns & Bridges –Replacing larger amounts of lost tooth structure and/or missing teeth. Are you interested in learning more about the Cosmetic Dentistry services that can make your smile more beautiful? 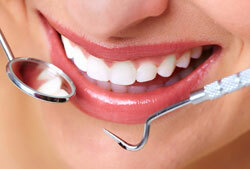 Call Dental Choice today at (410) 822-4310 and schedule a consultation at our Easton, MD office!